After breakfast take sightseeing tour of historic city visiting Old Delhi visiting the majestic Red Fort, a marvel in red sandstone, Jama Masjid, the largest mosque in India, both built by emperor Shah Jahan of Taj Mahal fame, Rajghat - memorial of Mahatma Gandhi & a Rickshaw ride past through the silver street in Chandani Chowk, the city tour continues covering New Delhi, visiting Rashtrapati Bhawan, one-time imperial residence of the British viceroys; the India Gate, a memorial raised in honour of the Indian soldiers martyred during the Afghan war; the Laxmi Narayan Temple, built by the Birlas, one of India’s leading industrial families; Humayun’s Tomb, lotus shaped Bhai’s Temple , Qutub Minar , built by Qutub-ud-din Aibek of the Slave Dynasty; in the evening you can visit see speculative Light and Sound Show at Red Fort. Return to the hotel for overnight at hotel. Breakfast at Hotel, transfer to the Railway station to board the train for Sawai Madhopur. Leave Delhi for Sawai Madhopur by Golden Temple Mail (0755/ 1310 hrs). Meeting and assistance on arrival at Sawai Madhopur Railway station and transfer to the Hotel. Ranthambore: With an area of 400 sq. km encompassing rocky hill crests which descend to open valleys between the Aravalli and Vindhya ranges, dotted with water pools and fruit trees, this park gets its name from the thousand year old fortress, which looms above the forest. Well known for the diurnal activity of tigers, Ranthambore is a very special and unusual area where a natural present meets a historical past. Sambar, cheetal, chinkara, nilgai and languor. The elusive leopard and tigers are found in this reserve with tourists standing a very good chance of seeing tigers during the day. Dotted across the landscape are the crumbling ruins of its past glory, be it chatris or cupolas, like palaces or old guard posts, all of which reinforce the magical and ethereal quality of this great wilderness. (The Park is closed from 01 July till 30 September.) Overnight at Hotel. Morning and afternoon visit the sanctuary by Jeep or Open Bus (Canter) with an English-speaking Naturalist. Overnight at hotel. 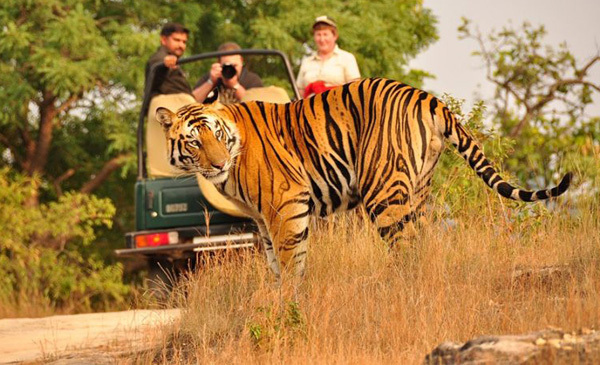 Enjoy Morning safari and later drive to Jaipur (170 kms). This journey is over very good roads, through rural Rajasthan and would take about 3 hours. On arrival check into the hotel. Rest of the day at leisure, in the evening hours enjoy walking in the colorful streets and bazaars of Jaipur City. The beauty of Jaipur is that its unique architecture and town planning is visible at even the most common places such as its squares and lanes. Overnight at Hotel. After a leisurely breakfast, visit the majestic Amber Fort, is one that cannot be easily described. Ride up on Elephants to the former capital of the roils set against the backdrop of the wooded hills. Later visit the Palace of Winds also known as Hawa mahal, this elaborate building, now little more than a façade, is encrusted with delicate screen sand carved balconies from which the royal ladies, confined to their quarters, could sneak views of the outside world. Past, present and future merge at Jai Singh's observatory, where time has been accurately measured since the 17th century. Evening enjoy dinner at Chokhi where you will have an idea of the village life of Rajasthan here you will also enjoy various traditional Rajasthani dances, puppet show and various other interesting activities. Overnight at hotel. In the morning visit the Bharatpur Keoladeo Ghana Bird Sanctuary by cycle rickshaws (the rickshaw drivers are all very capable naturalists). Later drive to Agra en route visiting Fatehpur Sikri (12 kms) Fatehpur Sikri - This exquisite city built by Akbar the Great in 1569, in red sandstone, with its forts, palaces and mosques was abandoned 14 years after its creation due to political reasons. The Diwan-i-am - a vast courtyard in which the emperor gave daily public audience; Diwan-i-khas - a large quadrangle which contained all the major functions of the Palace, Pachisi court, the Emperors private living quarter, Jodha Bhai’s Palace, Mariam’s Palace, Birbal’s Palace, Hawa Mahal and Panch Mahal are some of the important buildings of this residential complex. The Friday Mosque and the exquisite tomb of Sheik Salim Chisti are in the religious grounds set aside in a separate enclosure adjacent to the secular buildings. Continue drive to Agra after visiting Fatehpur Sikri (49 kms). On arrival, check in to the hotel. Rest of the day at leisure. Overnight at Hotel. On arrival at Umaria at 0600 hrs. A quiet little village that is gently awakening to the sounds of birds and cows. Arriving at this village, nestled in the “buffer zone” of the Bandhavgarh National Park, is an experience in itself. Meet and transfer to Hotel. The density of the tiger population at Bandhavgarh is relatively high. The possibility of spotting Sloth Bear, Wild Boar, Leopard and Tiger is very good. The park is also densely populated with animals like the Chital (Spotted Deer), Sambar, Barking Deer, Nilgai (Blue Bull), Chowsingha (Four Horned Antelope) and is rich in bird life. [The Park is closed from 01 July till 30 September. The terrain is rocky, rising sharply from the swampy and densely forested valley. The finest of these hills is Bandhavgarh , which is bounded by great cliffs and eroded rocks. The Bandhavgarh Fort, believed to be 2000 years old, stands at the highest point. There is a temple at the fort that can be visited by jeeps. Scattered throughout the park, particularly around the fort, are numerous caves containing shrines with ancient Sanskrit inscriptions. The ramparts of the fort provide a home for vultures, blue rock thrushes and crag martins. Lunch at the Hotel and visit the sanctuary by Jeep with an English-speaking Naturalist. Overnight at Hotel. Breakfast, Lunch and Dinner at the Lodge. Morning and afternoon game drives into the sanctuary. We can also arrange an excursion to see the imposing fort that is located inside the sanctuary. This Fort, or “Garh”, from which the park gets its name, is fascinating and involves a relatively easy climb to the temple located on its summit, dedicated to Lord Rama. The view from here is equally fascinating. Dinner and Overnight at Hotel. Breakfast and Lunch at the Lodge. Morning and afternoon visit the sanctuary by Jeep with an English-speaking Naturalist. Overnight at Hotel. Breakfast and Lunch at the Lodge. Morning and afternoon visit the sanctuary by Jeep with an English-speaking Naturalist. Late evening drive to Umaria to board the train for Delhi. Leave Umaria for Delhi by Utkal Kalinga Express at 2200 hrs. Overnight en route on board train. On your arrival at Delhi 1330 hrs, Meeting and assistance, transfer to hotel. (Room to be provided for Day Use till departure), rest of the time at leisure; in time transfer to International airport for your flight back to home.